It is for good reason that June is referred to as ‘growth month’. Green is coming out overwhelmingly now. Also the plants in the pond are going massively to the water surface. If the water surface threatens to grow thick, it is wise to start thin out. Reduce the number of lily leaves by cutting them below water level, using f.e. a Duo Pond Tool. Lily leaves that growth too close together and rise up from water later, as a result of which they will become more sensitive to the lily beetle and die off earlier. In this time of the year much pollen and different dust material is blown on the water surface of the pond. Keep the surface clear, using a surface exhauster, for example the Velda Pond Skimmer. Pay attention to the KH value or carbonate hardness, that it will remain high enough. It determines the acid binding capacity, which is important for the growth of oxygen producing plants. This will result in scrupulously clean water whereas it will prevent algal growth. The solution to protect your valuable fish is the Pond Protector. By stretching electric harmless fence wire herons will be prevented from approaching your pond. Of course, there are other ways to protect your fish. You can feed spawn additionally with pulverized quality food. They will grow quickly then and after 10 or 12 weeks they will no longer be chased by other fish. 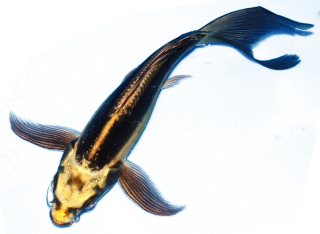 Symptoms of disease occur especially in new pond fish.